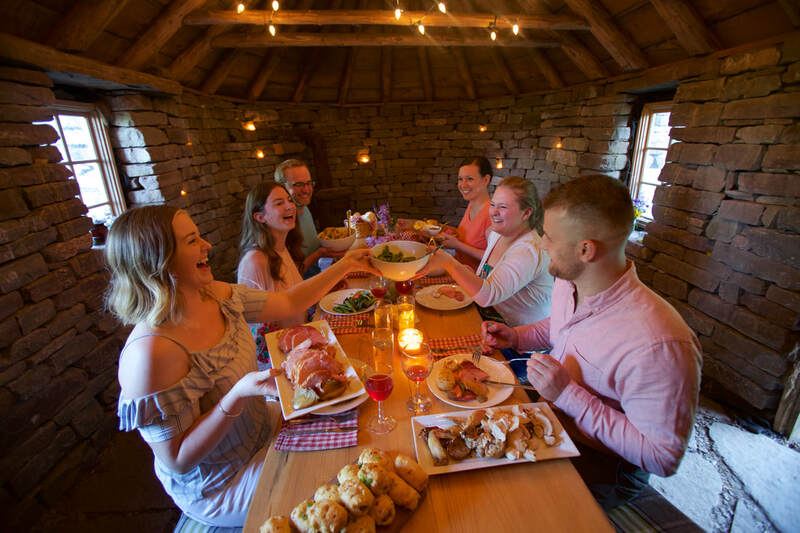 Join us for a farm to table dining experience in our one of a kind Blackhouse. Dinners run seasonally from May - October book a private dinner or join one of our theme dinner evenings! - Private Dinners: These dinners are for groups of 10-16 guests. Please see our Book your dinner now page for available dates. - Individual tickets: These tickets are available throughout the season and are available for purchase from 1-16 tickets. Individual tickets must be purchased in advance, please visit our individual ticket page to book your tickets. Secondly, you can book a private dinner for 10-16 people. In order to book a private dinner you must have between 10-16 people or pay the minimum cost for a dinner. "Just a quick note to thank you for a most memorable evening last night. We thoroughly enjoyed the setting and the food. My congratulations to you and your team on your hard work and special efforts to make the occasion so unique. We will definitely be recommending you to our friends - it is well worth the drive from Toronto." Join our Blackhouse Dinner E-newsletter list!